Warner continues with their issues from the splendidly-rich back catalogue of opera in the Teldec and Erato vaults. 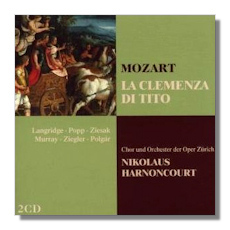 Harnoncourt's Mozart opera series has won diverse plaudits and this "Clemenza di Tito" certainly ranks amongst the very best for its thrilling sense of drama and cutting edge use of the orchestra. It is also a fine memorial to the late lamented Philip Langridge who died earlier this year – he makes a truly noble Tito Vespasiano. Compared to my selected recording of "Tito" which features István Kertész on Decca, I have to say that Harnoncourt rules the roost and at this price is a real snip. 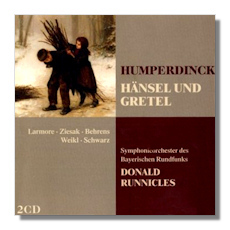 Donald Runnicles' equally excellent recording of Humperdinck's famous opera also deserves particular mention. The silky smooth orchestral sound from Bavaria is a real joy and the line up of soloists is quite impressive with Larmore and Ziesak at the top of their form although I still have a soft spot for the great Elisabeth Schwarzkopf in the inimitable 1953 Karajan recording with the Philharmonia. Otherwise this is probably the best modern version around at the moment also eclipsing another personal favourite which is Solti on Decca. This is definitely a top recommendation.